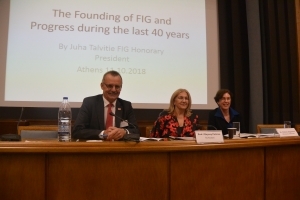 The year 2018 marks the 140 anniversary of FIG. 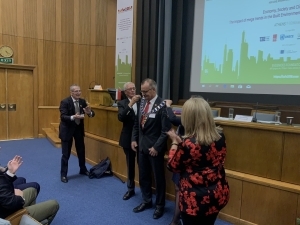 This special occasion was celebrated together with a handover event marking the end of term for current FIG president Chryssy Potsiou, Greece (2015-2018) to President Elect Rudolf Staiger, Germany, who will take over the FIG Presidency on 1 January 2019. 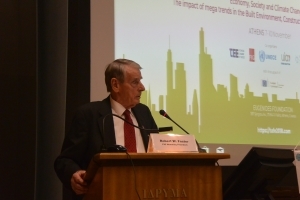 FIG President Chryssy Potsiou had organsed this remarkable event in Athens, Greece in conjunction with TUFE2018 - High-level International Interdisciplinary Conference with the overall theme: Economy, Society and Climate Change - The impact of mega trends in the Built Environment, Construction Industry and Real Estate. 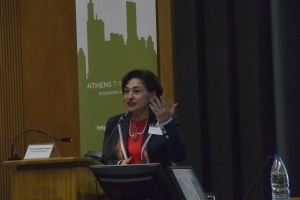 The Technical Chamber of Greece was main organiser of this special event that included apart from FIG, the Union of International Architechts, the European Council of Civil Engineers and UN-ECE. 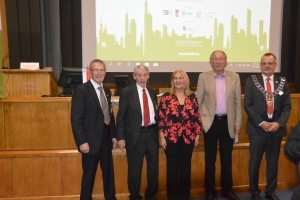 At the closing of the successful conference bringing surveyors, architechts and engineers together, a cooperation agreement between the organisations was signed. Please read more here. The festive celebration took place in the Eugenides Foundation, setting a beautiful frame for this special event. President Potsiou had managed to invite many special speakers and attendees who all contributed to a lively and nice atmosphere. 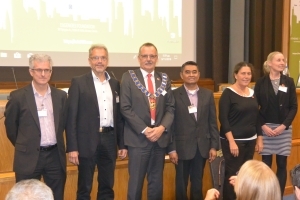 Three honorary presidents attended this event, Juha Talvitie, Finland (1988-1991), Robert Foster, US (2000-2002), and Holger Magel, Germany (2003-2006), three honorary members, Helge Onsrud, Norway, Daniel Steudler, Switzerland and Yerach Doytsher, Israel, current and incoming commission chairs, representatives from member associations, sister organisations and regional bodies. 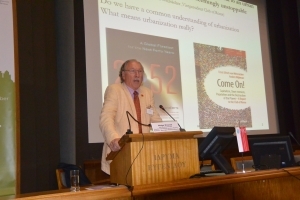 FIG Honorary President Holger Magel Key note speaker was Prof. Dr. Holger Magel who gave an impressive and inspiring talk about "Territorial justice- A new Paradigm for the Development of a Country" in which he argued that today, there is a big focus on cities, smart cities and the development of cities, but rural areas ought to get just as much attention. The key note presentation was an eye opener for many and it showed how passion, a large knowledge, and a long term effort can actually give results and attention to a relevant theme. 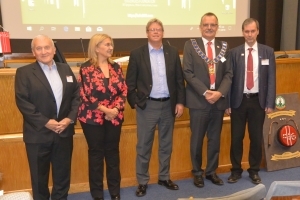 Honorary President Holger Magel was followed by other prominent speakers. Honorary Member Helge Onsrud talked about Building Services to Emerging Land Markets iformer Socialist Europe, Gerda Schennach, Chair of FIG commission 7 talked about the role of cadastre and land management for social stability, honorary member Daniel Steudler gave an introduction to the Multi-Dimensions in Cadastre, Maurice Barbieri, President of CLGE talked about Surveyors and Ethics go back a long way, Kwame Tenadu, Ghana, Chair of FIG Commission 8 and co-conference director for FIG Working Week 2021 had a presentation on sustaining multilaterism in FIG for our common good and Mansur Muhammad Kabir, Nigeria finalised the first part with the African perspectives in enhancing the prfessional collaboration and strategic partnership from 2014-2018. The first ever appointed FIG Ambassador Dr. Clarissa Augustinus also attended and gave a presentation. 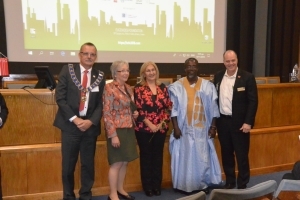 She has been working with FIG all the way back to 1993, and she told the story on how the Global Land Tool Network (GLTN) was born and FIG's role in this development. She described the impact that FIG has had on the development of tools to address land issues - tools that are now used with success at a country level. She finalised with a request and invitation to FIG to continue the influence on land related matters. It is a long haul to get all the way from an initial idea and wish to an actual result and outcome, but this is needed. 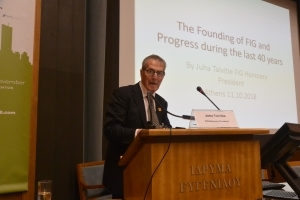 FIG is still after 140 years needed at a global level. 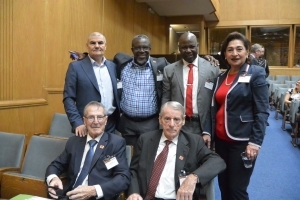 IT is not often that so many FIG presidents are represented at the same time and all three Honorary Presidents gave very impressive speeches to the somewhat younger audience, who listened carefully to their words. Juha Talvitie talked about the Founding of FIG and the progress of FIG during the last 40 years putting in perspective what FIG has accomplished, and Bob Foster spellbount the audience when he talked on ethics addressing ethical questions and cosiderations- among other things asking "what is our higher ethics". Very impressive. He amazed by also giving another speech on "Looking back and ahead" in which he also managed to make the audience think one extra time on ethical questions and in which he put FIG into a broader context. 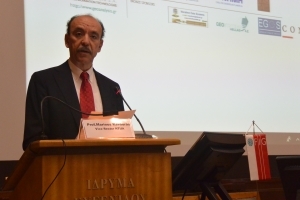 At the Hand Over ceremony there were addresses by the Greek hosts Technical Chamber of Greece/HARSE who have supported President Potsiou through all four years as president. Also by NTUA the School of Rural and Surveying Engineers, where President Potsiou is working as professor has supported these last four years. 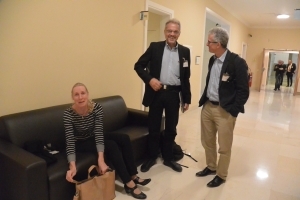 Some of the incoming chairs took some time to discuss the technical programme for FIG Working Week 2019, Marije Louwsma Commission 8, Hartmut Müller Commission 3 and David Mitchell Commission 2. 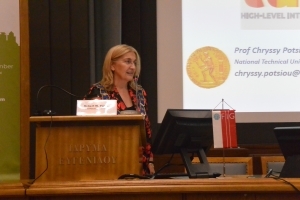 President Potsiou gave an overview of the results during the past four years and thanked not only the participants but all who have supported her during these four last years. 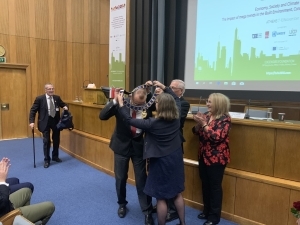 Finally the chain was handed over from Chryssy Potsiou to incoming President Rudolf Staiger. 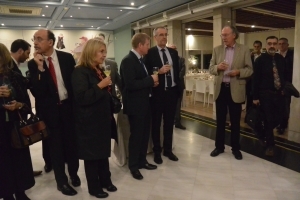 In the evening the celebration continued at Benaki Museum. After a very interesting tour of the museum Honorary President Holger Magel gave a very nice and very personal speech to the outgoing President. 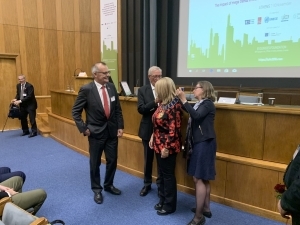 A very big thanks first of all to President Potiou for organising this very special event and to Technical Chamber of Greece for making this event possible and a reality. Also thanks to all the participants who travelled to Athens to take part in this very specail event and day. Also a special thanks to Prof. Charalabos Ioannidis, Dean of SRES, NTUA for his very special support during these past four years.